Now here is a pretty interesting set, and one that I had not thought about. It is pretty common knowledge that during war, one of the most widely used 'accessory' units were the engineers. These folks were called upon to do a myriad of tasks, but probably one of the most important was to keep the flow of supplies and replacements moving. This meant building and/or repairing roads and bridges. Often, if not a lot of weight was to be placed on a bridge, a simple affair made of wood and rubber rafts would suffice to get across small streams. This Dragon kit is just that. 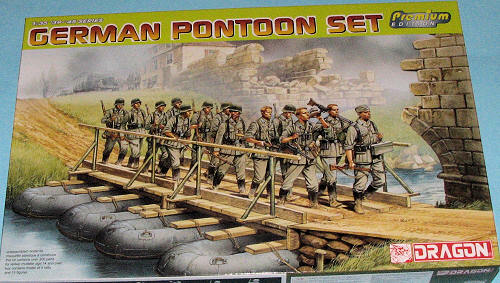 A small pontoon bridge made of four rafts with wood used for the bridge itself as well as for the accesses to it. The underside of the access points would usually be made from sandbags or rubble from the old bridge. 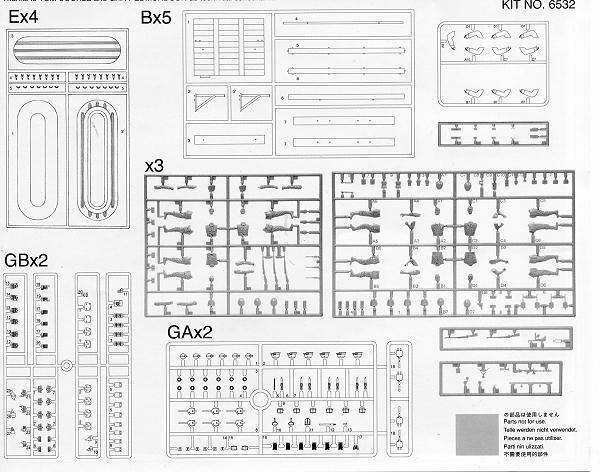 This kit provides parts for a four pontoon bridge as well as a mass of figures crossing it. The figures take up a majority of the plastic in this set and typical of Dragon, there is a wealth of possible options for the troops to carry. In addition there is a set of arms (we are talking the shoulder and elbow type) to replace those on some of the figures to provide a mixture of poses. Despite being basically figures and a bridge, this is a rather heavy kit and consists of over 300 parts, so it is by no means a weekend build. Instructions provide figure painting and assembly information as well as a 'how to' when it comes to constructing the bridge itself. Color information is provided via the usual Gunze and Model Master references. No specific information is given on using any optional bits; it is up to the builder's imagination to provide that. In all, it is a well thought out set and something that is a bit more unusual than the norm. My thanks to www.dragonmodelsusa.com for the preview kit. Get yours today at your local shop or on-line retailer.